As the name suggests this variety originates in Italy where it is widely grown for its highly nutritious, full flavoured and attractive leaves. Great for traditional winter crops of large and heavily ‘savoyed’ mature leaves as well as for tender baby leaves, for use in salads and stir fries. Sow indoors March to May. Sow thinly 0.5cm deep into trays of compost. Water well and place in a warm, light position, away from cold draughts and out of intense, direct sunlight. Keep the compost just moist and be careful not to overwater, the compost should almost dry out before it is watered again. Seedlings should start to appear in approximately 14-28 days. Carefully transplant the seedlings to individual pots when they are large enough to handle and keep moist. In late May or early June, acclimatise plants to outside conditions, avoiding any late frosts. Place pots outside in a sheltered spot during the day and bring them inside again at night when the temperature falls. Do this for a week or two, until the plants have hardened off. Then transplant to a sunny growing position 45cm apart. Plant them deep, right up to the first set of leaves and be sure to firm the young plants in well to prevent them from rocking in the wind, which can damage their delicate roots. Keep the soil moist and remove any weeds as they appear. Sow outdoors April to September. Kale can be sown directly outdoors for ease, although plants may take a bit longer to get going and therefore crop slightly later. If possible choose a sunny location for best results. All brassicas like good fertile soil so it’s worth digging in a slow release fertiliser or some organic matter before you start. Sow directly where plants are to grow, 1.5cm deep in shallow trenches 45cm apart. Cover the seeds with fine soil and water well. Keep the soil moist and remove any weeds as they appear. When young plants are 10cm tall transplant them to a final spacing of 45cm apart. Plant them deep, right up to the first set of leaves and be sure to firm the young plants in well to prevent them from rocking in the wind, which can damage their delicate roots. Keep the soil moist and remove any weeds as they appear. Once the seed packet has been opened, the seeds can be stored in an airtight container until required for further sowings. 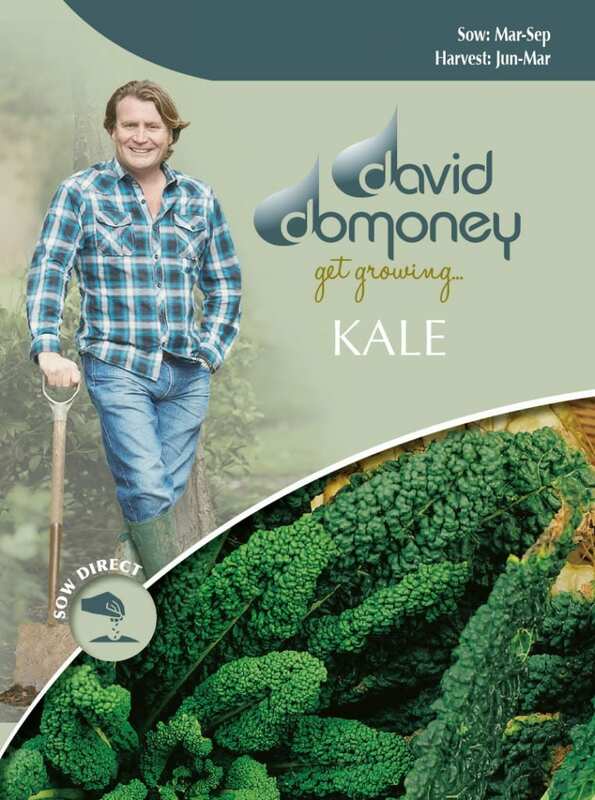 Kale seeds will maintain their vigour for a good number of years. Baby leaves can easily be grown in containers, re-sowing regularly for continuous crops of tender leaves. Mature leaves are not recommended to be grown in patio pots but can be grown in large raised beds. Young brassica plants are a real favourite with pigeons and later in the summer caterpillars can also become a problem. Covering them with a fine enough netting, held well above the plants, will stop both the pigeons eating the young plants and the cabbage white butterflies from reaching the leaves to lay their eggs. To prevent disease, rotate brassica crops so they are not grown in the same location for at least a couple of years. Harvest baby leaves from June, mature leaves from September to March. The leaves can be cut and used at any stage. It is good practice to clear away any remaining stumps when they are finished with, to prevent the growth of moulds, pests and diseases. Early outdoor sowings will benefit from cloche protection. Drawing a little soil up around the stems of developing plants will help to prevent wind rock as the plants get larger. Check plants after especially windy weather and firm them in again if necessary. Remove any older leaves if they yellow, this should encourage fresh young leaves to come through.